See list below and click on the thumbnails for more details. 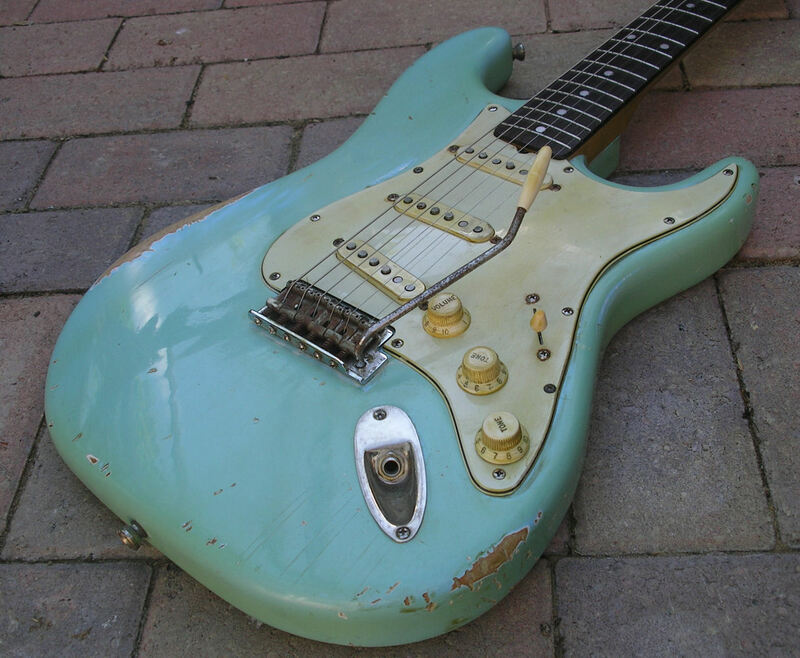 Heavy relic late '60s SC type guitar, large headstock maple capped neck, Bareknuckle pickups, all quality parts throughout. 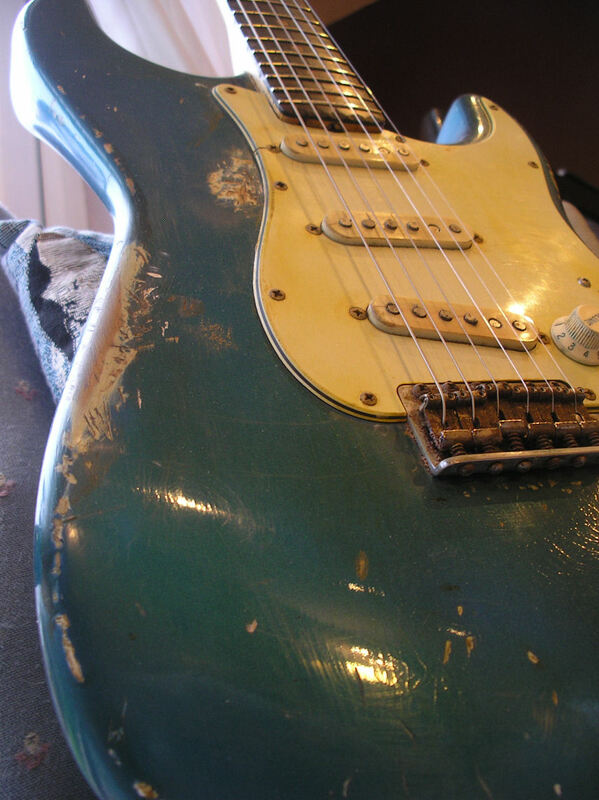 If you like 'em well used and something a bit different then this guitar is a perfect combination, click on the picture for more derails. Here's another custom build, no separate page for this yet. 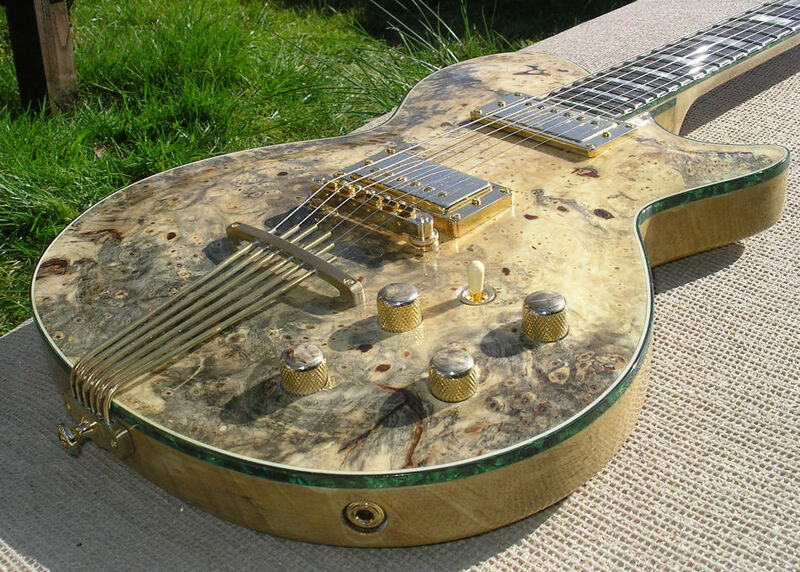 Chambered korina mahogany body, buckeye burl top, maple neck with ebony fretboard, gold hardware, custom made tailpiece, lots of nice detail touches such as the buckeye burl capped knobs, also the control cavity cover is grain matched to the back, unique headstock design, double layer pearl green binding, plain lacquer. 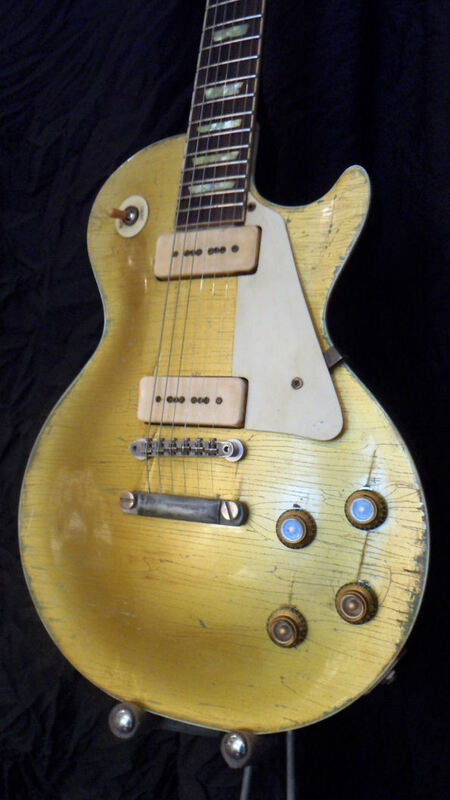 All top quality gold hardware, PAF pickups from Fatboy, Gotoh tuners. No separate page for this yet please get in touch for details. 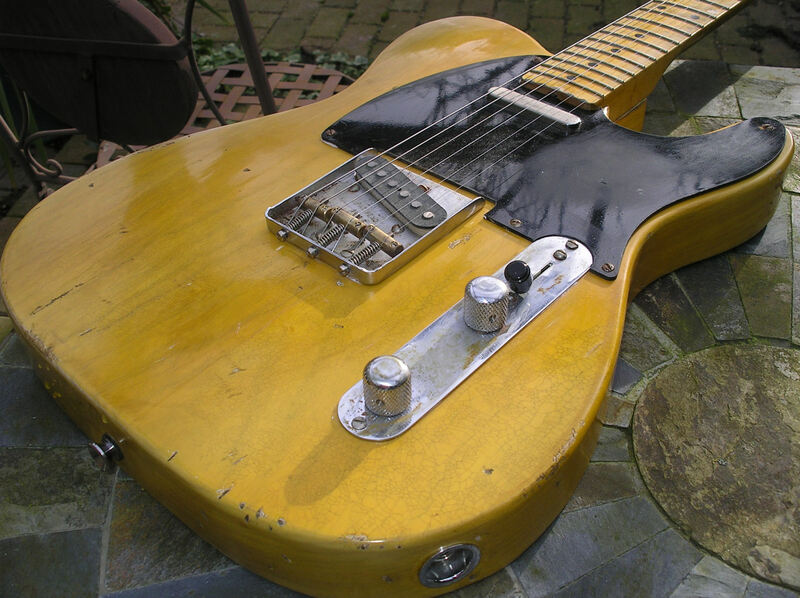 1957 Mary Kaye SC with gold hardware, This is has been built with no expense spared it has a lovely one piece ash body with a beautiful grain and a one piece vintage maple neck, all Fender hardware, Texas special pickups, cloth wiring and even a Luxe capacitor, the finish is completely nitro cellulose and tastefully relic'd, click on the picture for more details. 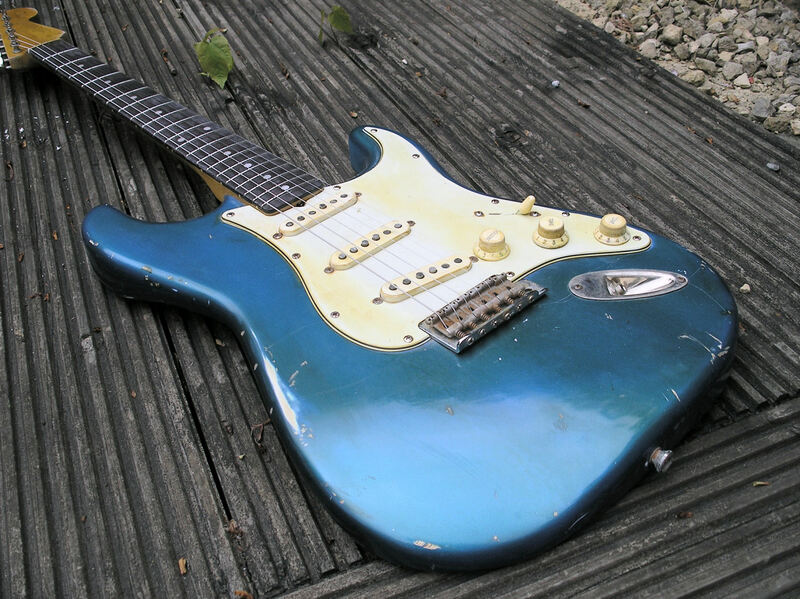 1965 Lake Placid Blue SC, Two piece alder body, correct rosewood veneer (curved join) mid sixties type neck, as usual with my guitars it has a full vintage correct nitro cellulose finish, all genuine Fender hardware, Pat Pend bridge saddles,steel block tremolo bridge, Texas Special pickups, cloth wiring, Kluson double line tuners, full pickguard shielding plate. (Click on picture for more details). 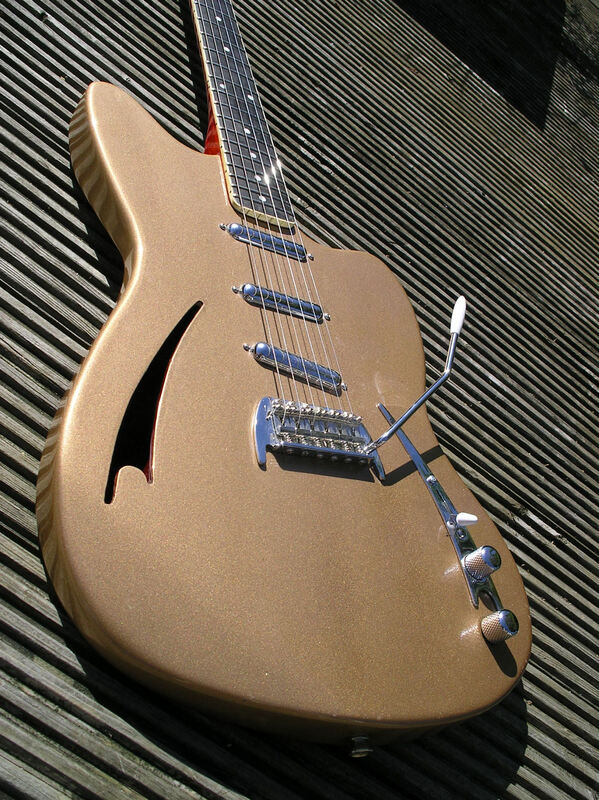 The Dina III guitar is a unique design based on a classic shape. The body is mahogany with a flamed maple cap routed to be thinline with a solid centre core. 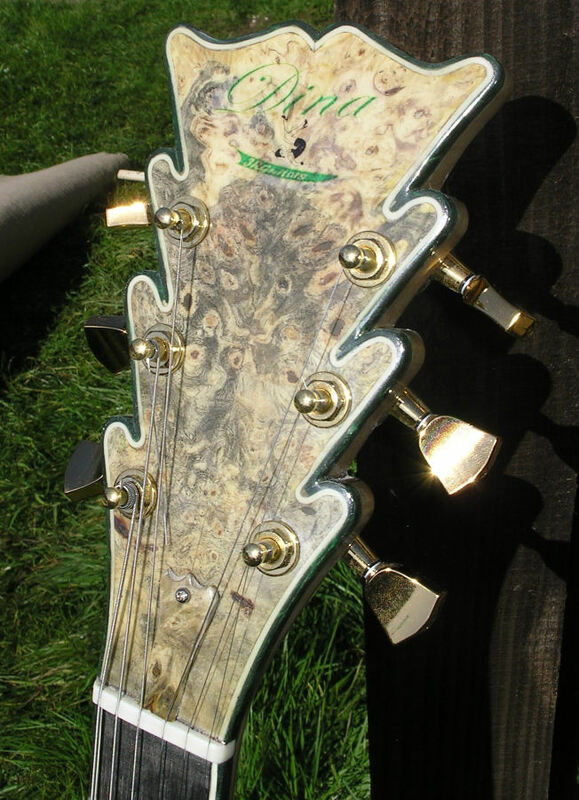 The neck is a quarter sawn mahogany set neck with reverse angled headstock . The fretboard is ebony, bound and inlayed with perloid crowns. 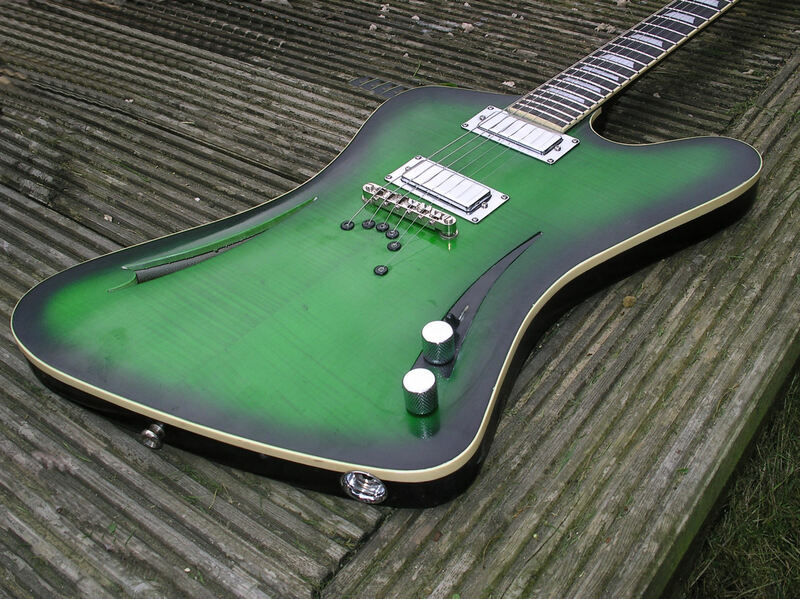 And of course finished in a beautiful transparent green and black nitrocelulose lacquer sunburst. Quality materials have been used throughout, before even plugging in, the guitar has a lovely acoustic tone with plenty of sustain, I'm sure aided by the string through body. It's lightweight, well balanced with a 24 fret neck. 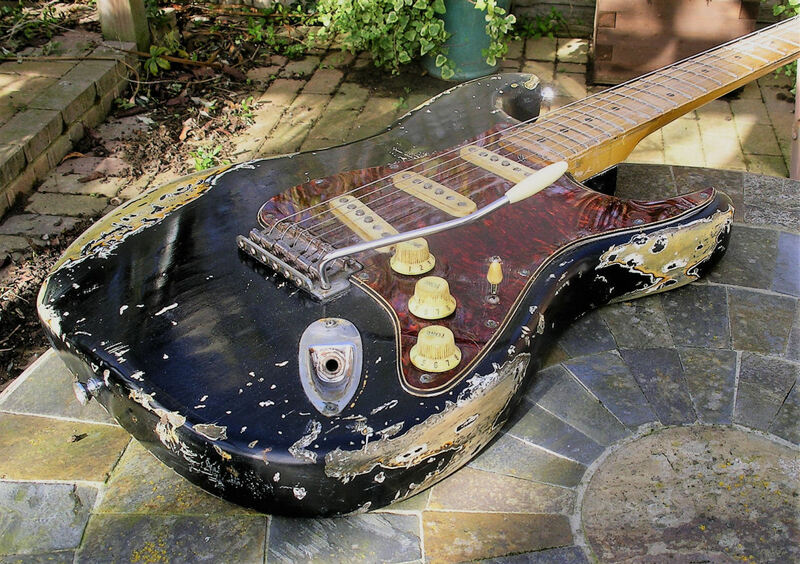 A very unique guitar and sure to stir a lot of admiring looks at any gig. (Click on the picture for more details). Please email for details and price. One of a kind violin bass, It's semi hollow with an arched back and top, built in the style of a violin but somewhat guitar shaped, string through body, blend, volume and tone are on the top edge (wheel style) and fitted with Seymour Duncan pickups. It has a 34inch scale length, with a tunomatic bridge and unique hand carved double bass style headstock. 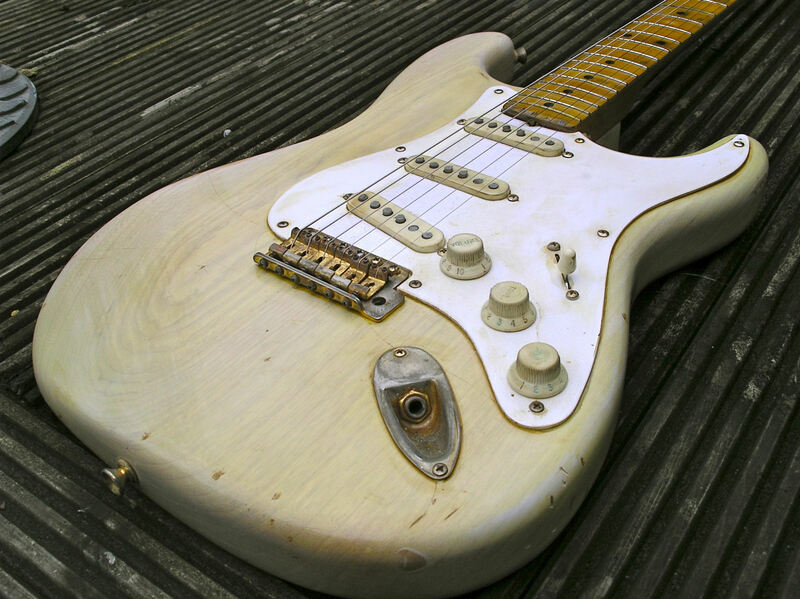 The guitar is finished in vintage nitro cellulose and is very lightly aged, built in tulip wood with a maple neck. I wanted to continue my trend of taking vintage/classic style guitars but building something unique. I am REALLY not planning to make another of these, it was SO much work, carving the top and back and especially the headstock which took an age. 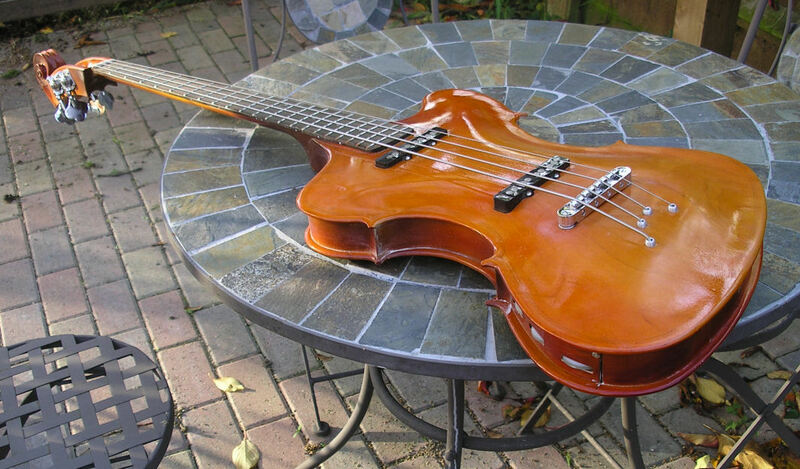 So here it is, my take on a violin bass. 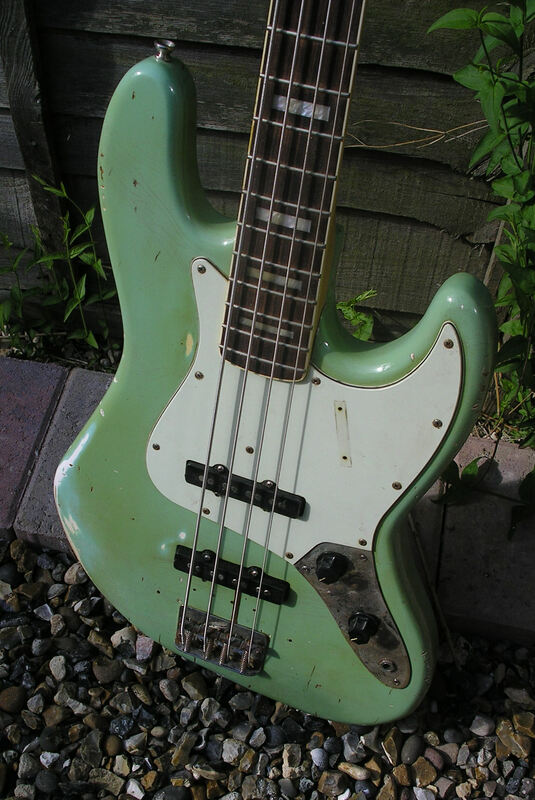 if you want a bass to make the audience gasp then this is most probably going to do that and you can honestly tell them that there isn't another one like it ANYWHERE and there most probably never will! I hope you like it.